More than 100 hundred years after it first caught fire, a coal bed beneath the Indian city of Jharia continues to burn. RT documentary, Inferno Village, explores how locals risk their lives to provide for their families, while a solution to the environmental disaster remains elusive. Jharia in northeastern India is home to one of the nation’s biggest coke coal reserves. Unmined material sitting under Jharia could be worth billions to India, according to some estimates, with the nation spending an average of $4 billion importing coke coal each year according to Reuters. In 1916, a coal fire broke out which continues to destroy land, properties and the health of impoverished locals. Poonam Nishad saw her house fall victim to fires undercutting the land. “Now I’m not even sure where my house was,” she says in RT’s Inferno Village documentary. “Six years ago it was perfectly normal: there was green grass, the area was lively, many families lived here, but today… You can see for yourself, it’s all like this,” she explained, pointing to smouldering fires inching toward homes. According to Bharak Coking Coal Limited, which took over the 110-square-mile area in 1973 after it was nationalized, the area’s problems stem from “unscientific exploitation” by previous private businesses. Despite Bharak Coking Coal Limited’s insistence on a “superior environment management system,” extraction still takes place at the site. In 2009, the government acknowledged the seriousness of the situation with a ‘Jharia master plan’ to rehouse people in safer areas. While the industry may be huge for government coffers, the financial benefits of a multi-billion-dollar coal mining business haven’t trickled down to those on the lowest rungs of Jharia society. As a result, some of the region’s poorest people must contend with heavy mining machinery and toxic conditions in order to eke out a meagre existence. Local man Pardeep Mahto describes how whole families scour quarries alongside large trucks laden with the fossil fuel to steal chunks of the natural resource. The work, which can often take days to complete, brings in about 600-800 rupees - the equivalent of about $10. The coal is sold on to restaurants, tea sellers or street vendors. 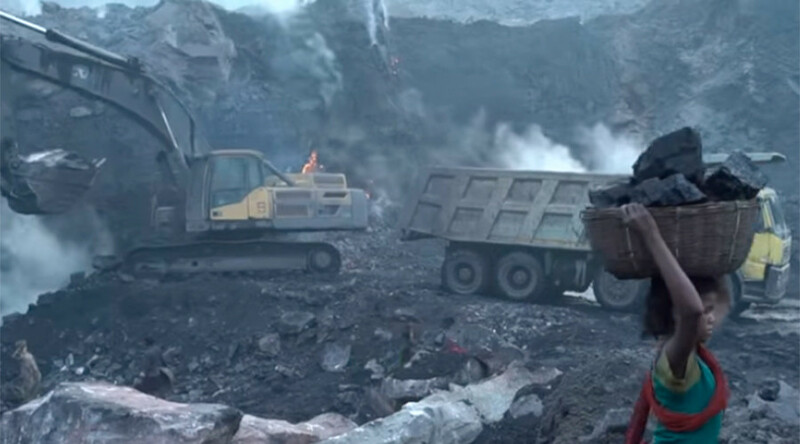 The black market trade is also a highly dangerous one, due to the physical effort of lugging large coal deposits, as well as long hours spent inhaling toxic dust and gases. However, for many people, collecting coal is their only source of income. Rajesh Chandrapal, headmaster of a Jharia school, said raging fires and blasting at the coalfield have put children’s lives at risk. Activist Ashok Agarwal has worked to highlight how mining robs communities of their homes while giving them very little in return. “Coal is the target. Everybody wants coal and the people here are treated just like robots. Around 700 to 1000 families will have to be evacuated today or tomorrow,” he said. Agarwal said townships like Belgaria, built by the government to house former Jharia residents away from underground infernos, have largely failed due to unemployment. He suggested that even though people may be able to escape the flames of Jharia’s coal field, they cannot pull themselves out of the poverty hole. “See, the people when they were staying on the fire, the reason was livelihood. They were getting coal over there. They may be pilfering it or collecting it, but they could sell it in the market and make ends meet. They could put two square meals on the table. Right now they are unable to do this,” he said. He also said that by removing people from housing near to coal reserves, the mining could continue unhindered.